The abducens nerve originates from neuronal cell bodies located in the ventral pons. These cells give rise to axons that course ventrally and exit the brain at the junction of the pons and the pyramid of the medulla. The nerve of each side then travels anteriorly where it pierces the dura lateral to the dorsum sellae. The nerve continues forward and bends over the ridge of the petrous part of the temporal bone and enters the cavernous sinus. 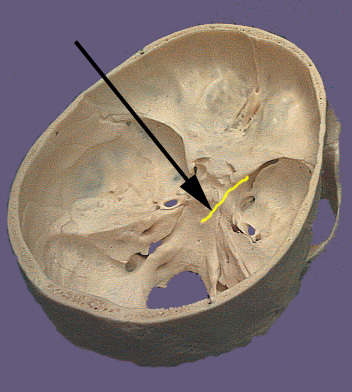 The nerve passes lateral to the carotid artery prior to entering superior orbital fissure. The abducens nerve passes through the common tendonous ring of the four rectus muscles and then enters the deep surface of the lateral rectus muscle. The function of the abducens nerve is to contract the lateral rectus which results in abduction of the eye. The abducens nerve in humans is solely and somatomotor nerve.